When it comes to dining in Branson, even the restaurants offer world-class experiences. Here’s a quick list of restaurants in Branson that offer a unique flavor to the way they do things. 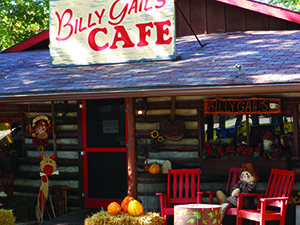 Billy Gail’s Café is that one-of-a-kind, off-the-beaten-path kind of place you were looking for. Serving breakfast and lunch, Billy Gail’s is a popular destination where folks come hungry and leave satisfied. What’s special about Billy Gail’s breakfast? It’s certainly their larger-than-life pancakes that can’t even fit on the plate! Or perhaps it’s the extra runny biscuits and gravy plates. On top of that, Billy Gail’s also operates a country store attached to the restaurant where visitors are sure to find unique crafts and souvenirs to take home. Billy Gail’s is “cash only” and does not accept credit/debit cards. You probably didn’t realize that Ozarks’ barbecue rivals Kansas City and Memphis until now. Danna’s BBQ is one barbecue joint not to overlook. What makes Danna’s a unique dining destination? The tenderly pulled pork, the smoked meats served with their special, homemade barbecue sauces, and their delicious burgers are just a few thing you’ll find on the menu that make this place really stand out. Find Danna’s near the intersection of Hwy 165 and Fall Creek Road in Branson, and also in nearby Forsyth, MO. 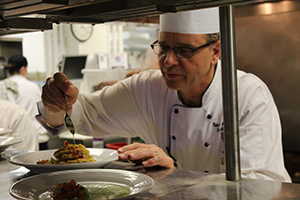 Experience the freshness of farm-to-table dining at The Keeter Center at College of the Ozarks. Grown and raised right on campus, The Keeter Center uses the freshest garden ingredients, meats, and produce to craft the delicious food served in the Dobyn’s restaurant. Waiters and waitresses at the Keeter Center are all students at the College of the Ozarks, a school where students work on-campus to pay for their tuition. The Keeter Center is open six days a week for lunch and dinner and on Sundays for the popular Sunday Brunch—reservations are required. Located inside the IMAX Entertainment Complex, the McFarlain’s Family Restaurant is one tasty, down-home, just-like-mama’s-cookin’ kind of place. Start with their special cornbread (served with honey butter), then try the crispy country fried chicken or steak, mashed potatoes, gravy, local fish, or any of their other specials. But it isn’t just the great food that makes McFarlain’s a destination. To find out the secret to McFarlain’s family fun reputation, ask for the “raising table” when you place the reservation. You just have to see it to believe it. Catch dinner and a show at Mel’s Hard Luck Diner. Mel’s is famous not only for its fun, 50’s diner atmosphere, but also for the singing waiters and waitresses who will serenade their guests throughout the day. Guests won’t be surprised to find themselves dancing, toe-tapping, or clapping while they enjoy their meal. Located in the Shops at Grand Village, Mel’s Hard Luck Diner specializes in great food, great music, and a unique, memorable experience for every new friend who walks in the door. Check out more Branson videos at Explore Branson’s YouTube channel.